Every now and then I run across an article that I find useful and informative... I was in the Sewing Machine Shop looking for a free motion foot for my Janome sewing machine and the sales associate gave me an information sheet "From the Bench" by Dan Schoenberg (of The Sewing Machine Shop in Walnut Creek, CA). I thought I'd post his information sheet here as I found it had some helpful information for improving my free motion quilting technique on my home sewing machine. One of the most common complaints we receive from customers is that their machine is not performing adequately while doing free motion quilting. To understand the difficulty of free motion quilting we must first understand what we are asking the machine to do. During normal sewing, all sewing machines are designed to make a stitch with the fabric feeding a pre-determined stitch length while the needle is out of the fabric. This is referred to as "feed timing" and is an adjustment that we always check during a tune and service. In addition, sewing machines are engineered to feed fabric away from the sewer and will always have the best stitch quality while doing this. Try sewing in reverse (fabric moving towards you) and notice how drastically your tension changes causing the bobbin thread to show on the top. When a sewer free motions, they move the fabric while the needle is in and out of the fabric so the machine has to form stitches while the fabric is moving; no easy task. In addition, the sewer is moving the fabric in multiple directions which, as noted above, changes tension characteristics constantly. The bottom line is that we need to compromise. 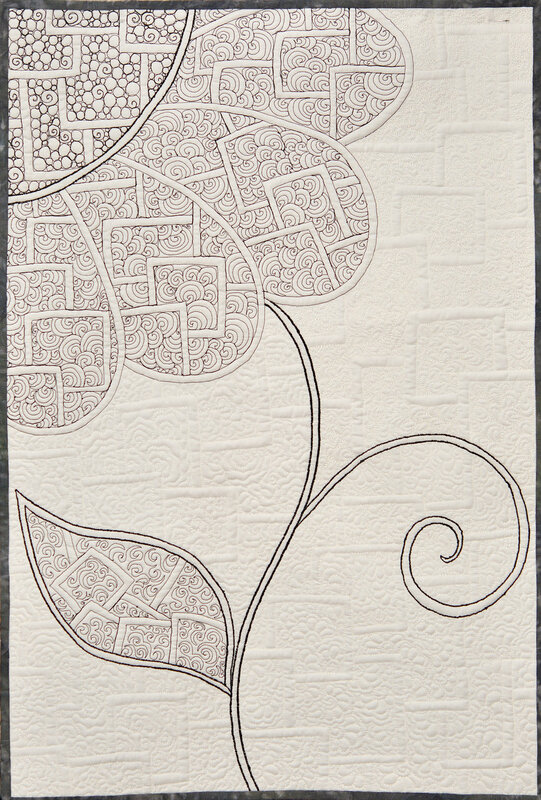 I will give you some great tips to get beautiful quilt stitches. The thinner the thread the better. The idea in all sewing is to hide the knot between top and bobbin thread. The thinner the thread the smaller the knot. I see a lot of quilters using fairly thick thread on both free motion and piecing. We really like Aurifil thread (Wooden Gate Quilts likes Presencia, also a 50wt long staple cotton thread but is 3-ply rather than 2 ply). It is thin yet strong and is very high quality. If you have to use thicker thread for effect, counter this with a very thin thread on the bottom (Wooden Gate Quilts sells a 60wt bobbin thread called Bottom Line by Superior Threads, we at WGQ love it!). To get uniform stitch length, you must keep the speed of the machine constant and move the fabric at a constant speed. It is impossible to move fabric at a constant speed, but it is possible to keep your machine constant by setting your maximum speed slider (most modern machines) at your desired speed and pressing your foot control all the way down (max). Keep your stitches between 2mm and 3mm as best as you can. This is the stitch length at which we balance tension and how most machines are pre-set at factory. Long stitch length leaves small loops on the underside and tiny stitches bring the bobbin thread to the top. It is especially important to keep your stitches from getting too long while doing curves as this really causes the eyelashes on the underside. Run a test prior to starting your quilt. First sew just away from you and towards you - back and forth. Then sew just from left to right back and forth several times. After observing your stitch, you can now make your final tension adjustment. Remember that tension stitch quality will not be the same as it will change as we change directions and as stitch lengths vary. We are making a grand compromise to put it in an acceptable range. If the top thread is too loopy on the underside, then we must increase top thread tension. If bottom thread is coming to the top, we must reduce top tension. I hope this helps you understand the dynamics of free motion sewing. Like always, we are here to help. Don't hesitate to see us if your free moon sewing is not up to snuff.